This post is part of our special coverage of Bahrain Protests 2011 . Anti government protesters on Monday morning blocked the National Council building where both Parliament and the Shura (Consultative) Councils hold their weekly sessions. The reason for the protest in front of the National Assembly is to topple the bicameral system in addition to the protesters’ other demands for a new constitution and the toppling of the regime. The National Assembly is made up of 40 members of Parliament, elected by the people, and another 40 Shura Council members, appointed by the King. 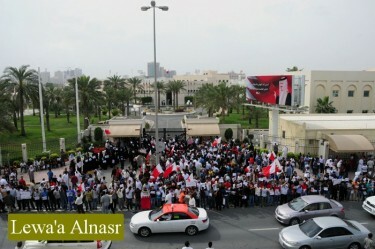 @DrFAHAD3500  400 protesters blocking the main gate of the parliament… WTH we have work to do!!! 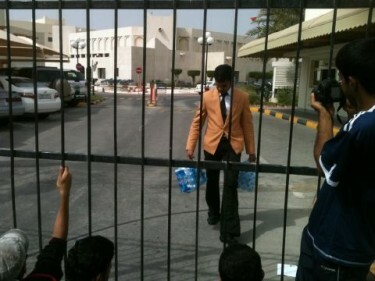 In a friendly gesture, Al-Shura council staff brought water to the protesters..
Al-Shura Council give out water bottles to the protesters and the youth say ‘Thank You'! Although some reports said that only eight of the original 40 Shura council members were attending the session, other reports said that the Shura council decided to hold an extraordinary session to discuss the current situation in the country. @ifowzan  مجلس الشورى ينهي جلسته بقرار عقد جلسة استثنائية يوم الأربعاء لمناقشة الأوضاع في البلاد ورفع توصياته الى طاولة الحوارالوطني..